Auburn QB Nick Marshall passed for two scores and ran for two more as he kept his team in contention for the playoffs. Well played selection committee, well played. The first playoff bracket for the College Football Playoff was released last Tuesday. Sitting at #3 and #4 were the Auburn Tigers and the Ole Miss Rebels who, oh by the way, were scheduled to play the following weekend. That set up the first elimination game of the season on the road to the top four teams that will play in the playoff. Pure genius! The Tigers came into the hostile environment of Oxford, Mississippi with the intent of silencing the home crowd. They took the opening kickoff and drove 73 yards in 8 plays with senior QB Nick Marshall running it in from two yards out. Late in the 1st quarter the Rebels answered with an 11 play, 92 yard drive to tie the score. Junior running back I’Tavius Mathers took it in from 4 yards out and the score was tied 7-7. Midway through the 2nd quarter, Ole Miss took a 14-7 lead on a 10 yard pass from senior QB Bo Wallace to sophomore receiver Laquon Treadwell. The score was set up by a 59 yard scramble by Bo Wallace down the left sideline. With 1:36 left before the half, Auburn tied the score on a one play, 57 yard drive. Marshall connected with junior receiver Sammie Coates for the score. Ole Miss was able to counter by connecting on a 47 yard field goal just before the half to take a 17-14 lead into the dressing room at halftime. The 2nd half quickly became a game of changing momentum. First, Wallace connected with sophomore tight end Evan Engram for a 50 yard score to take a 10 point lead. However, Auburn seized momentum and scored touchdowns on their next two possessions. First, Nick Marshall scored his second rushing TD of the game to cut the lead to three points, then Marshall hit sophomore receiver Marcus Davis for a 17 yard score to take a 28-24 lead going into the 4th quarter. As the last quarter started, you could feel the tension of both teams as they knew that a loss would likely put them out of the hunt for a playoff spot. On the second play of the quarter, Wallace scored on a 3 yard run to put the Rebels back on top 31-28. Auburn came right back on their next possession, moving 75 yards on 9 plays and senior running back Cameron Artis-Payne scored from 6 yards out to put the Tigers back up 35-31. On the Rebels next possession, it looked like they might take back the lead, but Wallace fumbled at the Auburn 6 yard lie and Tiger junior safety Derrick Moncrief jumped on the ball to end the drive. The Ole Miss defense stood tall and forced a punt, giving their offense another shot to take the lead with only 3:22 left. Wallace moved his team down into the Tigers red zone, but then were stopped on a heartbreaking play. Wallace hit Treadwell for what looked like a touchdown, but replay overturned the call. Treadwell lost the ball just before getting into the end zone. To add insult to injury Treadwell ended up with a broken leg on the play. That play sucked the life out of the stadium, but Ole Miss got one more shot by forcing another Auburn punt. They got the ball at their own 49 yard line with 0:26 left, however, they were not able to put together a scoring drive and Auburn escaped with a 35-31 win, keeping their #3 ranking intact. Ole Miss dropped to #11 in the rankings and probably has no shot to make it into the playoffs since they have two losses. 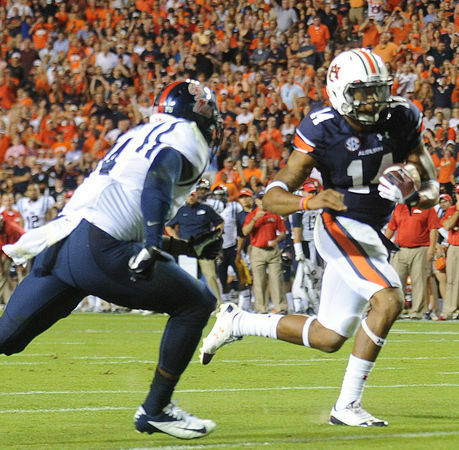 Nick Marshall, QB Sr (6-1, 210): Doesn’t have great size, but he is extremely athletic. Played defensive back for Georgia before transferring to Auburn. Vastly improved as a passer and has become a confident passer. Has become a true dual threat. Has good instincts and is a magician at running the option, making the defense wonder if he will run or pass. Very slippery in space and has a knack for avoiding tacklers and getting extra yardage. Strong arm. He is at his best when he is allowed to run around and create. Got hot when his team needed him in the 2nd half. Playing well enough to be a candidate for the Heisman. Completed 15 of 22 for 254 yards, 2 TD and 1 INT. Ran for 50 yards on 10 carries and scoring twice on the ground. Cameron Artis-Payne, RB, Sr (5-11, 210): Runs tougher than his size indicates. Not flashy, but is a very dependable north – south runner. Runs with good effort and is tough to bring down. Has a knack for weaving through traffic and gaining tough yards. Has become a workhorse for this offense. Led the team with 138 yards on 27 carries and scored a TD. His longest run was 20 yards. Corey Grant, RB, Sr (5-11, 205): Great speed. Lines up frequently in the slot, then gets the ball on the fly sweep. At his best when he gets to the edge. Versatile player that can also return punts. Had 4 carries for 26 yards. Duke Williams, WR, (6-2, 216): JC transfer that has added big play ability to the passing game. Has become the go to receiver in this offense. Good combination of size and speed. Uses his big body to shield off defenders. Able to make catches in traffic. Has the athletic ability to get above defenders to make receptions. Has amazing body control. Snatches the ball from the air with his hands. Had 3 catches for 71 yards and had a 41 yard reception. Sammie Coates, WR, Jr (6-2, 201): Another speedster that isn’t a great route runner, he just runs past defenders. Makes plays. Tough to tackle after the catch. Does a good job coming back to the ball when the QB is in trouble. Has the athletic ability to climb the ladder over defenders. Great concentration! Led the team with 5 catches for 122 yards and a 57 yard touchdown. Had a 41 yard catch to go along with the 57 yarder. Quan Bray, WR, Sr (5-10, 195): Doesn’t have the size of Williams or Coates. Versatile player that can return punts. Makes people miss after the catch. Had 4 catches for 37 yards. Ricardo Louis, WR, Sr (6-2, 212): Used more as a runner than as a receiver. Effective on the fly sweep. Plays special teams. Had 2 carries for 16 yards and caught 2 balls for 7 yards. Was called for a personal foul, late hit on a punt return. C.J. Uzomah, TE, Sr (6-5, 264): Spends more time blocking that catching passes. Only has 6 catches for the year. Mostly a fullback/H-Back type player that is a key blocker in the running attack. Angelo Blackson, DT, SR (6-4, 306): Good run stuffer. Able to shed blockers quickly to disrupt running plays. Had 4 tackles, 2 ½ tackles for loss and 1 sack. Cassanova McKinzy, MLB, Jr (6-3, 249): Active run defender. Leads the team in tackles for loss. Had 6 tackles, 1 ½ tackles for loss and ½ sack. Kris Frost, OLB, Jr (6-4, 234): Leader of the defense. A tough player that fights through injuries. Does a good job blitzing the A gap. Led the team with 9 tackles, 4 tackles for loss, ½ sack and recovered a fumble in the red zone to stop a scoring opportunity. Jonathan Jones, CB, Jr (5-10, 182): Not real big, but competes for the ball. Very good ball skills. The majority of his interceptions are in the red zone, killing scoring opportunities. Had 5 tackles and was called for a personal foul. Derrick Moncrief, SS, Jr (6-2, 218): Good size. Good instincts. Had 6 tackles and 1 forced fumble in the red zone. Bo Wallace, QB, Sr (6-4, 217): When the Chicago Bears were beaten by the Colts in the Super Bowl, the phrase you heard often was Bad Rex/Good Rex referring to the Bears QB Rex Grossman. Wallace is the same type of player. When he is hot, he can look very good and then all of a sudden he does something that makes you want to pull your hair out. Wallace does a good job eluding pressure, extending plays and throwing on the run. When he scrambles, he looks downfield to find the open receiver. Not a great runner, but he’s gritty and can at times move the sticks with his feet. Emotional competitor with an average arm. At times he can let himself be caught up in the emotions of the game and hurt his team. Made a bad decision late in the 4th quarter when he fumbled the ball in the red zone while trying to extend the ball past the 1st down line. Completed 28 of 40 for 341 yards with 2 TD. Ran the ball 14 times for 56 yards with 1 TD. I’Tavius Mathers, RB, Jr (5-11, 190): At his best when he can get the ball outside the tackles. Has ability to break tackles. Left the game in the 2nd half with a concussion. Carried the ball 7 times for 43 yards and a touchdown. Had a long run of 34 yards. Jaylen Walton, RB, Jr (5-8, 166): Small and quick. Not the type of back to carry the ball 20 times per game. Does better when he can get the ball to the outside. Versatile player that is #3 all-time in kick return yards at Ole Miss. Had 6 carries for 22 yards and 1 catch for -1 yard. Vince Sanders, WR, Sr (6-1, 185): Runs good patterns. Knows how to shield off defenders on slant pattern. Good speed. Good yardage after catch guy. Had 6 catches for 105 yards. Had a 24 yard reception. Ben Still, C, Jr (6-3, 298): Started the game at center, but was then forced to move to right tackle early in the game because of injuries. Did a decent job playing out of position. Justin Bell, RG, Jr (6-3, 252): Good feet. Does a good job getting out in front of sweeps. Also a good trap blocker. Fahn Cooper, OT, Jr (6-5, 312): Started the game at right tackle, but quickly had to move to left tackle due to injuries. A physical player with ability to pancake blockers. Has the feet to get downfield and help on long runs. C.J. Johnson, DE, Jr (6-2, 225): Undersized defensive end that may have to convert to linebacker at the next level. Quick first step. Had 4 tackles and 1 tackle for loss. Woodrow Hamilton, NT, Jr (6-3, 315): Big body that ties up blockers. Had 2 tackles. Serderius Bryant, OLB, Sr (5-9, 220): Small and fast. Very quick off the edge. Led the team with 14 tackles and 2 tackles for loss. Senquez Golson, CB, Sr (5-9, 176): Small, feisty player that is #2 in the country with 9 interceptions. Ballhawk that plays the ball in the air. Competes against larger receivers and comes down with the ball. Likes to jump routes. Does a good job supporting the run. Had 1 INT, but dropped a pick six late in the game that would have had him tied for the lead in interceptions nationwide. Also had 5 tackles and 1 pass breakup. Mike Hilton, CB, Jr (5-9, 182): Smart player that plays bigger than his size. Tackles well in space. Wraps up on ball carriers and supports the run well. Had 8 tackles and 1 ½ tackles for loss. This entry was posted on November 5, 2014 by draftmaniacs in Uncategorized and tagged 2015 NFL draft, Angelo Blackson, Auburn, Auburn Tigers, Bad Bo, Ben Still, Bo Wallace, C.J. Johnson, C.J. Uzomah, Cameron Artis-Payne, Cassanova McKinzy, College football playoff, Corey Grant, Derrick Moncrief, Duke Williams, Elimination Game, Evan Engram, Fahn Cooper, Good Bo, I'Tavius Mathers, Jaylen Walton, Jonathan Jones, Justin Bell, Kris Frost, Laquon Treadwell, Laquon Treadwell injury, Marcus Davis, Mike Hilton, NFL, NFL Draft, Nick Marshall, Ole Miss, Ole Miss Rebels, Quan Bray, Ricardo Louis, Sammie Coates, Senquez Golson, Serderius Bryant, Vince Sanders, Woodrow Hamilton.